We’d love your help. Let us know what’s wrong with this preview of Camp Panda by Catherine Thimmesh. To ask other readers questions about Camp Panda, please sign up. This review has been hidden because it contains spoilers. To view it, click here. 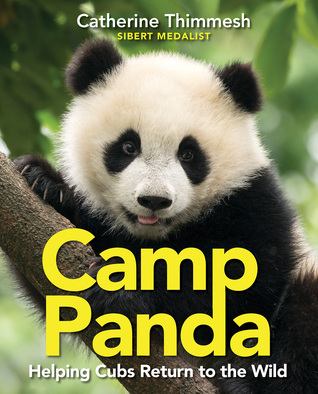 Both educational and engagingly recounted, Catherine Thimmesh's Camp Panda: Helping Cubs Return to the Wild sparkles primarily and mostly because it is such a balanced and unexaggerated (unemotional) offering, in so far that the author has penned her chapters in a well researched and academically sound fashion, meticulously and with essential and careful attention to detail (but also never with too much scientific mumbo jumbo either) showing what "Camp Panda" is all about (and yes, I have found Both educational and engagingly recounted, Catherine Thimmesh's Camp Panda: Helping Cubs Return to the Wild sparkles primarily and mostly because it is such a balanced and unexaggerated (unemotional) offering, in so far that the author has penned her chapters in a well researched and academically sound fashion, meticulously and with essential and careful attention to detail (but also never with too much scientific mumbo jumbo either) showing what "Camp Panda" is all about (and yes, I have found the use of panda costumes to limit human interactions between panda cubs and the scientists involved in "Camp Panda" both a bit humorous and also more importantly totally ingenious), but nevertheless also never shying away from pointing out that there have been both successes and failures and that indeed even the scientists involved had to learn the hard way that the less human interference there is with regard to caring for and monitoring the captive panda cubs before releasing them into the wild, the better are their chances of long-term survival (which is essential for panda conservation and protection efforts as even though the panda is considered a national treasure in China, it is still critically endangered and its bamboo forest habits are still under constant pressure and threat from human encroachment). Now while I do appreciate the fact that in Camp Panda: Helping Cubs Return to the Wild Catherine Thimmesh mentions that there also are a few dissenting voices with regard to protecting pandas and saving them from possible and likely extinction, I for one do find both the viewpoint that pandas are not a good conservation species due to their supposed natural "fragility" and especially the attitude that humans and human problems such as homelessness, hunger and poverty somehow should outweigh and be of more significance and importance than protecting endangered animals rather naive and callous at best. For with regard to pandas being regarded as too fragile to protect and thus an evolutionary dead-end so to speak, well, pandas were thriving and surviving just fine until their habitats and their bamboo forests were decimated by human deforestation and fragmentation and sorry, the idea that humans are somehow more important and worthy than other animals is in my opinion simply and utterly vile and hugely nastily ignorant, especially considering that many if not most of the threats with regard to possible extinction that vulnerable animal species are currently facing are generally the direct result of our, of human behaviour and actions (although I do nevertheless still consider it a positive that Catherine Thimmesh has mentioned dissenting views in Camp Panda: Helping Cubs Return to the Wild, in particular because she always does clearly and succinctly and without extremism then present exactly why these dissenting opinions are basically unsound and rather problematic at best). This definitely deserved the Sibert! The photos are lovely and completely accessible to a child's interest span. It is about a perennial kid interest, the adorable black and white panda. The text is at the perfect level: informative, age appropriate with absolutely no condescension. The text is fascinating. It explains thoroughly the additional benefits to other species that helping pandas return to the wild will have, both as an umbrella species (helps other species in the same geographical are This definitely deserved the Sibert! The photos are lovely and completely accessible to a child's interest span. It is about a perennial kid interest, the adorable black and white panda. The text is at the perfect level: informative, age appropriate with absolutely no condescension. The text is fascinating. It explains thoroughly the additional benefits to other species that helping pandas return to the wild will have, both as an umbrella species (helps other species in the same geographical area and as an example of hope and encouragement to the world that such interventions are viable and can be done with other species as well! There is a great page titled Stepping up to save a species - what can YOU do? There are also photo captioned biographies giving quick descriptions of people involved in the panda restoration effort. First sentence: Lumbering down the grassy mountainside in southwestern China--being careful not to slip--is a giant panda teddy bear. Premise/plot: This one is subtitled: Helping Cubs Return to the Wild. The book is a cautious celebration of a new re-introduction program in China. It's a program designed to reintroduce giant pandas back into the wild--giant pandas born in captivity. The idea is that humans have largely contributed to the plight of the giant panda--both directly, indirectly. It is up to humans to come up with a solution. Or perhaps I should rephrase that to be a part of the solution. Researchers have to think long-term and big-picture. Researchers have to take things slowly--not rush the process. Researchers have to be adaptable and be willing to change as they go. One aspect of this new program is that baby pandas never see their human caregivers. Humans wear panda costumes when interacting with the pandas. Another aspect is that it is all about providing an environment where baby pandas can learn, can grow, can become more and more independent in taking care of all their own needs. My thoughts: The book isn't a comfy-cozy read all about happy-happy success stories regardless of the reality. Like most nature shows, this one is realistic. It is neither happy-happy or bleakity-bleak. The audience, I believe, would be those in elementary and/or middle school. 3.5 stars. An informative, quick read about efforts to reintroduce pandas to the wild in parts of China. The photographs are definitely the star of the show! Well-paced and interesting. The Giant Panda, a proud flagship animal from the mountains of China, has experienced such devastating loss of habitat since the 1950’s that by 1990 they were declared an endangered species. In the early 2000’s attempts were underway to reintroduce cubs born in captivity back into the wild in order to keep the population healthy. Reintroduction along with other conservation techniques such as habitat restoration, education and studies of local human populations, and protection from poaching have The Giant Panda, a proud flagship animal from the mountains of China, has experienced such devastating loss of habitat since the 1950’s that by 1990 they were declared an endangered species. In the early 2000’s attempts were underway to reintroduce cubs born in captivity back into the wild in order to keep the population healthy. Reintroduction along with other conservation techniques such as habitat restoration, education and studies of local human populations, and protection from poaching have combined to increase the wild population 17 percent by 2016 which takes the species from endangered to now being considered a vulnerable species. Thimmesh covers the topic of panda conservation efforts with a holistic approach as she presents the realities of not only the panda, but other species endanger of disappearing around the world. After giving the reader the information they need to understand what is happening, she details the efforts to reintroduce pandas born in captivity to the wild. Large color photographs and charts help to draw the reader in to the text. Book extras include a glossary, index, sources, what you can do to help, and a biography page of the conservation experts working to save the pandas. I would highly recommend this book for purchase by any school or public library. *** Updated information: This book won a 2019 Seibert Honor Medal for distinguished Non-Fiction! Thimmesh, Catherine Camp Panda: Helping Cubs Return to the Wild, 60 pages. NON-FICTION Houghton Mifflin Harcourt, 2018. $18. Content: G.
Human encroachment is the main cause for Giant Pandas growing extinct. This book explains what scientists are doing to help increase the panda population as well as their environments which will help other endangered species. The book explains reintroduction training that the scientists implement on the pandas and the ways that they try to take human interactio Thimmesh, Catherine Camp Panda: Helping Cubs Return to the Wild, 60 pages. NON-FICTION Houghton Mifflin Harcourt, 2018. $18. Content: G.
Human encroachment is the main cause for Giant Pandas growing extinct. This book explains what scientists are doing to help increase the panda population as well as their environments which will help other endangered species. The book explains reintroduction training that the scientists implement on the pandas and the ways that they try to take human interaction out of the panda’s experiences. The Giant Panda is a much loved animal and it helps draw attention to other endangered animals as well. This informational text has lots of interesting and detailed facts about pandas being reintroduced into the wild. The reading level and vocabulary as well as amount of text is higher than elementary, so this book would fit better in a middle school in maybe an animal biology unit. The photographs are interesting and at the back of the book there is a glossary as well as what efforts the reader can make to help conservationists. This would need a teacher guided discussion because I’m not sure many kids would pick it up to read for fun, even though I found it very interesting and well done. MS – OPTIONAL. Reviewer, C. Peterson. A lovely book with photographs of various species that are endangered and/or bordering on extinction. Although the main thrust is explanation of the plan to rescue the pandas, it also explains that in helping them, other animals under the panda's umbrella (i.e. those who exist in the panda's territory) are also helped. It was interesting to realize that many people don't take an interest in endangered species because they know nothing about them and that Pandas, tigers and polar bears have becom A lovely book with photographs of various species that are endangered and/or bordering on extinction. Although the main thrust is explanation of the plan to rescue the pandas, it also explains that in helping them, other animals under the panda's umbrella (i.e. those who exist in the panda's territory) are also helped. It was interesting to realize that many people don't take an interest in endangered species because they know nothing about them and that Pandas, tigers and polar bears have become the "flagship" species because of their high visablity and appeal to many. A great book for an older child that has a real interest in the environment, science and zoology. Not only informative, but my word, the humans in panda suits holding a panda cub? Fantastic....and kind of creepy. But apparently it's a fairly successful way to get the pandas reintroduced to the wild. Who knew?!? Would you be willing to wear a hot, stinky panda suit to save this species? LOVED this book. So easy to read. So much potential for classroom use in grades 3-6. • Ask a series of questions (like the one that leads into this review) to pique student interest. • Post photos from the book – using a document camera and ask students to make Would you be willing to wear a hot, stinky panda suit to save this species? •	Ask a series of questions (like the one that leads into this review) to pique student interest. •	Post photos from the book – using a document camera and ask students to make predictions about what they would learn if they read this book. •	Read aloud the first chapter “Pandas in Peril” and ask students to discuss before leaving in classroom library on display. •	What jumped out at you as important? •	What does this make you think about? •	How does this part connect to another part in the book? •	What are you wondering about (that you might have to do more research to find out)? •	Why is this book important? •	What are lessons humans can learn from what happened to the pandas and what the Chinese are trying to do to rectify the situation? •	How did the author persuade you that ‘camp panda’ is an important endeavor? I’d integrate this into a unit of study—specifically, NGSS that deal with human impact on the environment and development of technology/innovative systems for change. This book made me hopeful. Hopeful that we can save species that are in danger, that we can turn around how we treat the Earth and all of its inhabitants. Into the wild. The need to have no human interaction or dependence, puts scientists and researchers into panda costumes treated with panda poop and urine whenever they need to do medical exams or transport the Cubs. Thus confronted by humans without costumes triggers proper warnings and danger alerts. I am all for introducing kids to vocabulary words, but this was written at such a high level that I don't know if my 3rd graders could get through it. And the layout could be distracting ... on one spread, I saw large sans-serif type for the chapter's first paragraph, average serif type for the rest of the text, italicized serif type for an expert's quote (WHY? ), and small bold sans-serif for a caption. The sidebars have yet another font. The information itself was somewhat interesting - I did a I am all for introducing kids to vocabulary words, but this was written at such a high level that I don't know if my 3rd graders could get through it. 2019 Sibert Honor Award. I’d probably rate it a 3.5, if I could. Informative but for some reason I became restless, bored, and just wanted to finish it. I was shocked at the loss of habitat due to population growth and increase in infrastructure. I applaud Chinese researchers for attempting to help the pandas. It will be interesting to see over time if it works considering China’s push for economic supremacy in the world. With beautiful photographs and engaging text, Thimmesh carefully explains the panda's plight and the work that has been done and continues to be done to save pandas. Thimmesh explains why pandas became endangered and carefully outlines the steps taken to reintroduce cubs from captivity into the wild. This is a lengthier book for the child who is truly panda obsessed - but it is an interesting look at the work being done to rebuild the panda population. Beautifully photographed and richly detailed, this book explains the efforts in China to reintroduce pandas to the wild. This was longer than I expected, but it was full of great info and fun pics. JOB OPENING... you too can get paid to dress up in a panda costume, smear yourself in Panda scent (pee and poo) and you get to hold pandas. This is a great book! Not only is it about cute panda bears, it is about conservation and extinction. I learned a lot from this book!! My non-fiction text I chose was, Camp Panda; Helping Cubs Return to the Wild. I would compare this text to 2 fictional texts by the same author Steve Antony, I’ll Wait, Mr. Panda, and Thank You, Mr. Panda. With these books we would compare and contrast pandas in fiction versus non-fiction. I would use a compare and contrast venn-diagram to compare similarities and differences. For example, in the fictional texts the pandas are wearing clothes, talking, cooking, giving presents, flying in a hot-air balloon. In contrast, Camp Panda depicts pandas in their natural habitats, eating bamboo, climbing trees, and interacting with their cubs. However, both texts show what real pandas look like with their colorings and body type. We would discuss the difference between real photographs vs. drawings. There is also a man dressed up as a panda bear in Camp Panda. I would like to use this to discuss why it isn’t real. (looks, carrying the cub, putting the cubs into cages) I would also tie in why pandas are in trouble and why they are dressing as pandas to help. Non-fiction is written not only for facts and information but also can be persuasive. It is important for students to be able to differentiate between animal fantasy in fiction and nonfiction. It is also very important to point out the call numbers of fiction vs. non-fiction. Antony, S. (2018). Ill wait, Mr Panda. London: Hodder Childrens Books. Antony, S. (2019). Thank you, Mr Panda. London: Hodder Childrens Books. Thimmesh, C. (2018). Camp Panda: Helping cubs return to the wild. Boston: Houghton Mifflin Harcourt.